As Ukraine Looks Elsewhere, Gazprom Plans No Let Up in Exports « News.Kyiv.Me. While the government in Kyiv vowed to cut its energy reliance on its former Soviet ally, Moscow-based Gazprom PJSC plans to deliver the equivalent of as much as 41 percent of Ukraine’s demand last year through 2018, according to its non-public budget approved in December and obtained by Bloomberg News. Ukraine stopped importing gas from Russia three months ago, saying it cost more than supplies from the European Union. While sales by Gazprom and its affiliates to Ukraine, a key part of transport infrastructure to the EU, have fallen 90 percent over the past decade amid pricing disputes and a contracting economy, they were still worth $1.7 billion last year. Gazprom and its Ukrainian counterpart, NAK Naftogaz Ukrainy, declined to comment. The state-controlled producer plans to ship 8.8 billion to 14.1 billion cubic meters (310 billion to 500 billion cubic feet) of gas a year to Ukraine through 2018, compared with sales of 6.1 billion cubic meters last year. 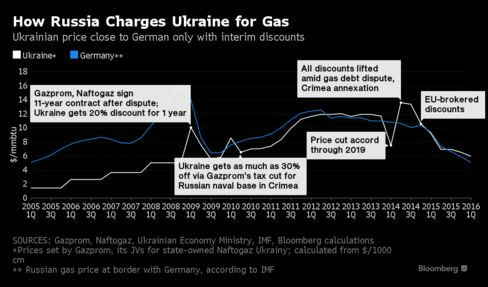 The company budgeted several export scenarios, including one mirroring the average sales price in Europe, which this year could be 15 percent less than the oil-linked price in Naftogaz’s contract. Naftogaz and Gazprom filed claims against each other in an international arbitration demanding almost $26 billion and $32 billion over their gas supply and transit contracts in effect through 2019, respectively. Ukrainian officials have said the country will do its best to cope without Gazprom’s supplies if there’s no agreement on fair pricing. The country is probably hoping not to buy any Russian gas at all this year, said Renaissance Capital analyst Ildar Davletshin. 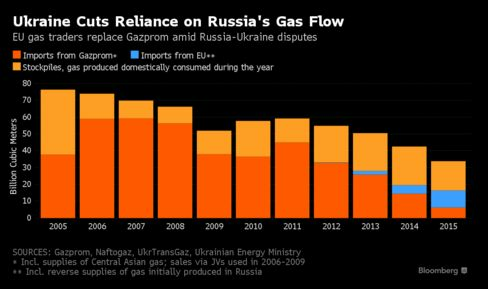 European suppliers, including RWE AG, Engie SA and Statoil ASA, stepped into the gap left when Gazprom cut its supplies to Ukraine for the first time in 2014, after Ukraine’s Kremlin-backed President Viktor Yanukovych was ousted. At least part of the fuel is diverted Russian gas, according to Gazprom. An arbitration ruling on the contract with Naftogaz is expected by the middle of the year at the earliest.